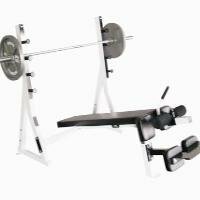 COM-CDP Features: -Decline bench.-Contains commercial padding.-Handle on leg lock for convenient in and out.-Comes with pre drilled bolt holes.-Ideal for bolted to floor.-Comes with custom cushioned bench pad. Includes: -Included multiple racking positions and optional spotter stand. Dimensions: -Overall dimensions: 51" H x 48" W x 81" D.